I have a confession to make: I’m guilty of not following good fitness protocol. I have been wearing a way-too-old, way-too-many-miles-on-them pair of sneakers for the past several months. When I did a half marathon in late March, I wore my go-to pair — i.e., my newest pair. It rained for the entire 13.1 miles. After the race, I figured I’d better retire the pair because they probably were stretched out and just plain shot from all those wet miles. Plus, they were high on the mileage count to begin with. My reliable No. 2 pair, promoted back to the lead position. Because it was still wintry, I bumped up my old pair to the No. 1 spot, knowing I wouldn’t be doing lots of walking until spring had fully sprung. Well … it’s now mid-July and I’m still in that old pair. Part of the delay is just due to the busy-ness of everyday life: work, chores, errands, plans. But most of it is due to simple timing. I do most of my walking in the early morning. Therefore it would be best to shop for sneakers first thing in the day, so the size of my feet is most comparable to when I will most often be wearing the sneakers. In other words, if I shopped after work, my feet would not be the same size as they would be in the morning. And then, when I’d go out for a morning walk, the sneakers would likely feel loose. That could lead to blisters and injury. At long last, my schedule and my desire to buy new sneakers have aligned, and I plan to be at the sporting goods store tomorrow morning when it opens. While we’re on the topic: How often should you replace your walking sneakers and what type should you get? Your shoes might not look outwardly worn out. But the cushioning and shock absorption likely are not doing their job as well as they should anymore. The general rule of thumb, as advised by experts, is to replace your shoes after 300 to 500 miles of walking. If you walk for about an hour, three times a week, replace your sneakers every 5 months. If you walk that amount four times a week, it’s time for new sneakers every 4 months. And if you’re walking about an hour five times a week, you’ll need new ones every 3 months. And what type of shoes should you get? It’s all about what feels best for you. New Balance is my brand of choice because it has a roomy toe box and a more narrow heel — which fits me best. I buy running shoes instead of walking shoes because I find the running shoes to be more flexible and light than the walkers. Plus, I do incorporate some jogging interval workouts most weeks. My best advice: Try on, try on, try on. Try different brands. Try wide and medium widths. Try them with the socks you’ll most often wear while walking. Walk around the store for longer than seems normal. Above all, make sure they feel supportive and comfortable and fit well. And shop at the same time of day when you most often walk. That will help ensure the best fit. 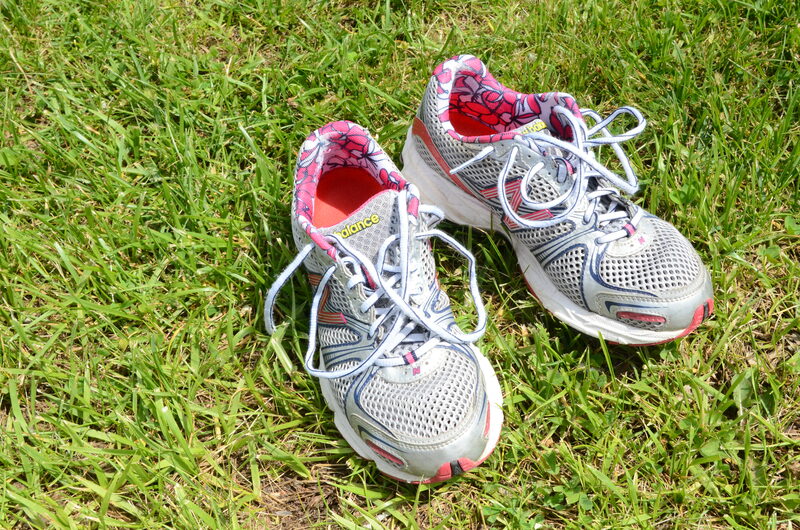 This entry was posted in Advice and tagged mileage, replacing sneakers, sneakers, walking, walking shoes by Walk With Joelle. Bookmark the permalink.